I’ve just received a book through Amazon which I gifted myself for Christmas. It’s called INTUITION: SOUL-GUIDANCE FOR LIFE’S DECISIONS. 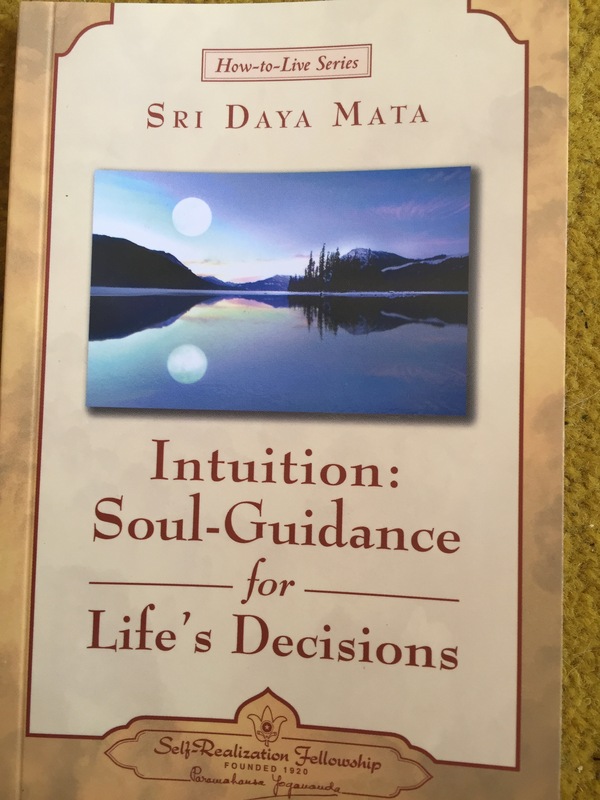 It’s written by Sri Daya Mata, and is part of a “How to Live” series of books which use the teachings of Paramahansa Yoganada, author of AUTOBIOGRAPHY OF A YOGI, to apply spirituality to one’s everyday life. Intuition is soul guidance, appearing naturally in man during those instants when his mind is calm. The goal of yoga science is to calm the mind, that without distortion it can hear the infallible counsel of the Inner Voice. Question: Faced with the many difficult choices and conflicting options that are a part of life in the day-to-day world, how can we discern whether a decision is the right one or whether it merely seems right because of our personal desires and an attachment to our own inclinations? Answer: First of all, we all have to realise that for most people, the vast majority of their actions and decisions are tinged with personal desires. That is normal. That is human. What the great ones teach is that we should first concentrate on replacing harmful desires with wholesome ambitions that unfold our highest nature. To know how to choose correctly in any given situation, we need to guide our judgements by the power of intuition. we are all endowed with this “sixth sense,” but most persons do not use it. Instead they rely on the reports of the five lower senses. But those five senses do not always supply the right data so that we can make the right decisions. They have limited scope and power, and they interpret things according to their own likes and dislikes rather than according to what is true. To know what is true you have to go within. If you do so daily, you become more balanced, calmer, your discriminative insight awakens. Discrimination, which like intuition is a quality of the soul, enables you to discern the things you ought to do when you ought to do them. It is by meditation that these soul-faculties are developed. thanks Bill for the reminder that meditation is almost as important than beathing.It is the key to a better and more connected LIFE.Bises and Feliz Navidades. So very true Marie. Hoping you have a truly wonderful Christmas. love from me and Jennifer.